During the monsoon, I tend to prefer scooters over a motorcycle due to the protection its front apron offers from the muck and grime that wet roads tend to throw up. This monsoon, however, the TVS Apache RR310 has been my daily ride. If there’s one thing it has made me realise, it’s the fact that a fully faired bike too offers a certain degree of protection from the muck. If I were on a naked bike, the front wheel would have picked up water and sprayed it right onto my boots and trousers. On the Apache RR 310, however, the large fairing between your boots and the front wheel so your feet are insulated from everything except deep puddles. And dry feet makes me happy. I wish that the windscreen could offer similar protection from the muck, though. The low-set screen has a tendency to deflect tyre spray from the vehicle in front straight onto the helmet. TVS, can we get a taller windscreen please. Now while the fairing keeps my boots dry, it seems to deposit that muck directly on to the radiator and engine parts like the oil cooler and keep it there. This means the motor runs at slightly higher temperatures than it does during the summer. This isn't as much an issue as a niggle, as I didn’t have any issue with engine heat. Other niggles include the indicator switch that seems to have attracted moisture and requires a firm push to cancel out. I wanted to find out how the Apache RR 310 reacts to premium fuel. For this, I tanked up the bike twice on regular fuel and twice on premium fuel over the course of 2000 kilometres. One immediate difference is the bike runs smoother with most of the low speed jerkiness ironed out. It also feels a tad more responsive. While there is a slight jump in fuel efficiency, it does not justify the economics of running on premium fuel as the price difference between the two fuels is quite substantial. However, the Apache RR 310 is definitely happier on the higher octane diet. In the last report, we had discussed about the braking issues, for which the bike was sent to TVS service for a quick checkup. The engineers there had the brake pads cleaned, which did improve the brake feel a bit. However, the lack of initial bite remains an issue. The Michelin Pilot Sport tyres hook up well under hard acceleration on wet roads but lack outright grip while braking and cornering in these monsoon conditions. Add to that the ABS’ tendency to cut in early means I am riding the Apache RR 310 with more caution than I would like to. It’s a little disappointing as the RR 310 is a hoot to ride fast in traffic. I intend to send the RR 310 for yet another service for brake adjustment and other minor issues that have cropped up over the last one month. Pune’s bad roads seem to have taken a toll on the RR 310’s front suspension setup as the bike seems to involuntarily steer to either side at slow speeds. Hopefully, both issues should be sorted out well in time for my next road trip. Yamaha R15 V3.0 Is Awesome: True Or False? Share your experiences with Apache RR 310? 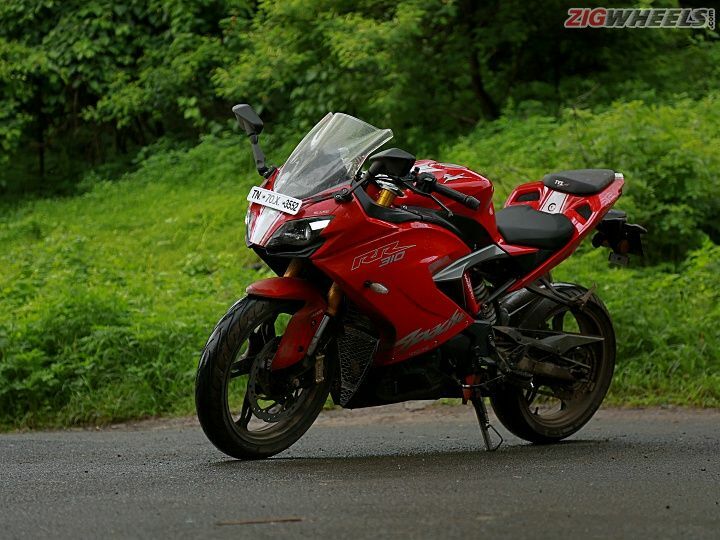 Confused about TVS Apache RR 310?